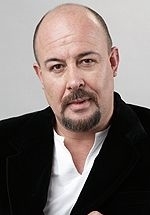 Jamie Bartlett is an English-born South African actor best known for his roles as the shady Mike O'Reilly in the SABC3 soapie Isidingo; and as villain David Genaro in the e.tv soapie Rhythm City. July 2016 marked 10 years since he began starring on Rhythm City, from the first episode of the show. In 2016 Jamie replaced Lalla Hirayama as the third judge on the e.tv reality competition show SA's Got Talent. He was married to actress Camilla Waldman of Generations fame. The couple had a son, Hector, and later divorced.